These three pocket-sized books contain the Doc Rat daily (Monday-Friday) comic strips from #951 to #1088 (February 15 to August 25, 2010), #1089 to #1218 (August 26, 2010 to February 23, 2011), and #1219 to #1426 (February 24 to December 12, 2011). Each volume collects approximately six months of the strip, except that Jenner does not break them off in the midst of a story sequence. That is why volume 10 runs to 110 pages, the longest in the series to date. For about twenty years after graduating from the university, Hilton was assigned to provide medical services for a series of small towns around western Australia, from which he sent his Furry cartoons to America. During a stay as the doctor for the coal-mining town of Collie, he drew an anthropomorphic comic strip, DownUnderGround, for the local newspaper. He finally settled in permanently as a GP in a suburb of Melbourne. His character of Doc Rat began appearing in individual cartoons in medical and non-medical publications during the 1990s, and on June 26, 2006 he launched Doc Rat as a Monday-Friday comic strip on the Internet. Since then Doc Rat has picked up an international following, including placing as one of the five finalists in the Best Comic Strip category for the 2012 Ursa Major Awards (as well as 2011 and 2009). Ben is a thirty-something, Australian general practitioner rat, battling the odds to run a solo practice in the suburb of Templeton, in the city of Fornor, state of Flora. After setting up shop eight years ago, prepared to do what it took to succeed against the long hours, on-call work, endless red tape and local competition from the nearby medical centre, he continues to fight to stay afloat. An experiment with a very entrepreneurial practice manager, Charmane Prideaux, didn’t solve the problem - she was a hungry lioness, and even now she’d gone, Ben’s accountant is still finding the leftover bones. For the moment, though, Ben remains good-natured and conscientious, carrying out a professional job to the best of his ability. He tries to make people better. He also gives money to street buskers and is kind to pets. After a fraught and adventurous romance, he married Daniella Hood, his tae kwon do instructor and dentist. The two rats are now just settling down into married life together. Doc Rat has over two dozen regular main and supporting characters by now, not to mention the one-off characters. The strip relied upon standalone jokes and puns at first, centering upon the medical profession, but has come to feature longer and more dramatic story arcs including backstories for the main characters. For those who prefer longer, dramatic story arcs to a series of independent gags, volume 10 is what you have been waiting for. It and the two previous volumes make the complete story. These three volumes are an informal set that complete a long story arc in three respects. Ben and Daniella, who have been dating for some time, finally decide to get married. Their future interactions are controlled by this decision. Ben learns about “secret bunny business”, and his & Daniella’s knowledge of the rabbits’ private language, Lapine, is revealed. One of Ben’s regular patients, who has become a good friend, is Flopsy Jaegermond, a wolf therian who feels that he is a rabbit. He married Jasmine, a rabbit widow with four children from her first marriage, and they have been very happy together. However, at the start of vol. 8, Flopsy reveals to Ben that both of their families hate their inter-species marriage. 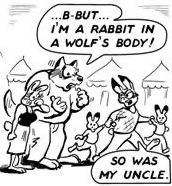 Most wolves regard rabbits only as food, and the rabbits are aghast at the idea of Jasmine revealing “secret bunny business” to her non-rabbit mate. What is secret bunny business? “WHAT DO YOU KNOW ABOUT SECRET BUNNY BUSINESS?! !” Ben’s rabbit associates all ask him angrily when he casually mentions it. In vol. 8, Ben and Danella wed and embark on married life. Daniella meets an old boyfriend who now has a wife and children, and puts her past behind her. Flopsy and Jasmine attend a rabbit’s Bungaree; and, as the result of what happens there, Flopsy is accepted into rabbit society. Vol. 10 is the main event. Jenner even says so in a special Introduction. “This DOC RAT BOOK is a milestone, and the story in it is the biggest thing that’s ever happened to Doctor Ben Rat and his crew.” There are (almost) no gag strips. It’s all drama. Flopsy’s and Jasmine’s relationship with respect to the rabbits has been settled, but how Flopsy’s old wolf pack regards his “betrayal” and his “embarrassing all wolves” is another matter. Also, the whole topic of predator-prey animal relations in an intelligent mixed-animal society has barely been addressed up to now. Jenner develops it in detail in vol. 10. Flopsy has seemed to be a loving adoptive father to Jasmine’s rabbit kits, but his being a rabbit therian aside, he is still physically a carnivore who needs meat to survive. When Jasmine’s young children start to disappear, Flopsy is the obvious first suspect. When a second child is taken, a fox, Martin Bracken, is identified. He has eaten the rabbits legally (“It was LEGAL! I did the PAPERWORK!”), but Flopsy visits him to “have a word with him”, and Bracken agrees that, when he recovers, he will stick to farm meat rather than hunting wild meat. 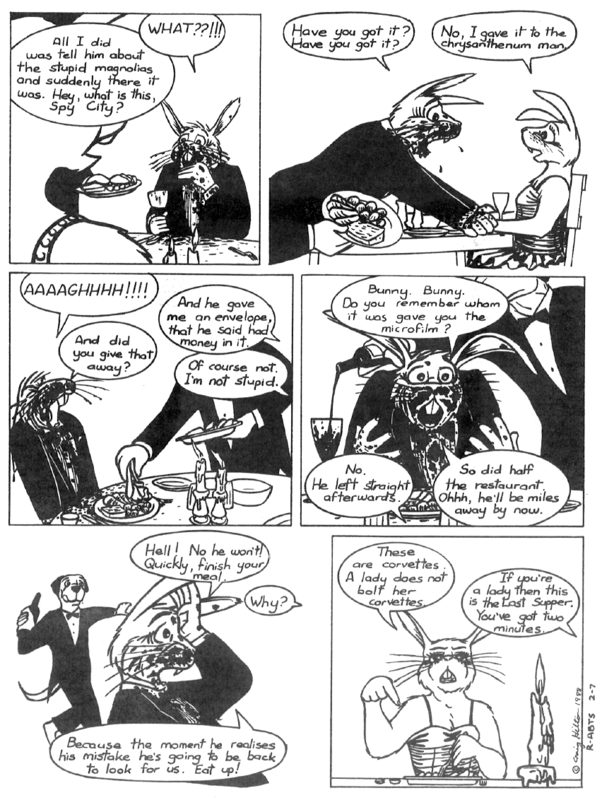 Bracken’s wife complains that they should sue Flopsy for his physical retaliation to their legal food-gathering, but they know he has a top rabbit lawyer who would plead “defense of the family”. Flopsy tells his backstory of what happened to Jasmine’s first husband, and how he became a rabbit therian. Ben and Flopsy join Phil, the gorilla chemist, and two friends for a weekend of fishing and “male bonding” at Hanging Drop Lake, where personal secrets are revealed. Flopsy plans to win immunity for Jasmine and her babies from other wolves by getting the elderly clan alpha to acknowledge them as a wolf’s family. He does, but he does not know that a faction within the clan has been preparing to challenge the alpha for leadership. They decide that finishing off the rabbits will be their opening move. Ben and Daniella break off a dinner engagement to race with Pat the tiger florist to their rescue. There are few anthropomorphic comic strips that go into the details of a well-thought-out multispecies predator-and-prey talking-animal city. With vol. 10, Doc Rat has become one of the best. If you are not yet familiar with this long-running Internet comic strip, vol. 10 is an excellent place to start, with volumes 8 and 9 to give you the necessary background. Volumes 8 and 9 are $16.00 Australian dollars each, or $12.95 U.S. dollars, and vol. 10 is AUS$18.00 or US$14.95. The U.S. price includes mailing from Jenner's agent in the U.S. Jenner’s books are self-published (and look very professional), and are only available from one bookshop in Melbourne and from his own website, payable through Paypal. They are expensive, but worth it.